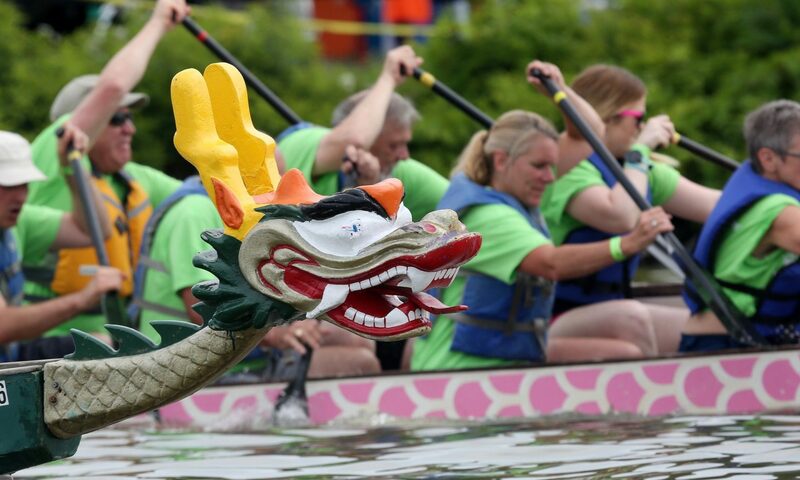 Dragon Boat TEAMS can be sponsored for $1,500. This includes paddler registration for up to 20 people (16 paddlers, 1 drummer, 3 alternates), and acknowledgement of the BUSINESS/ORGANIZATION online. Sponsors’ logo will be proudly displayed on the Dutchess Dragon Boat Race & Festival website and the Habitat for Humanity of Dutchess County website with a link to their own website. Sponsors will also be acknowledged on the Dragon Boat Race Facebook page. Teams will compete in 3 or 4 races (depending on number of registered teams). This includes 2 qualifying races and 1 or 2 races toward the championship. The top three winning teams will receive trophies, and each winning paddler will receive a medal. All paddlers will be expected to solicit their friends, families and co-workers for sponsorship of their participation. A Fund Raising guide will be emailed to each paddler upon registration. All donations will go to Habitat for Humanity of Dutchess County for their mission of building safe and affordable homes in our community.